To Dog With Love: Norman Scooter Dog Rides for World Record Today! Norman Scooter Dog Rides for World Record Today! UPDATE: Norman did it!! 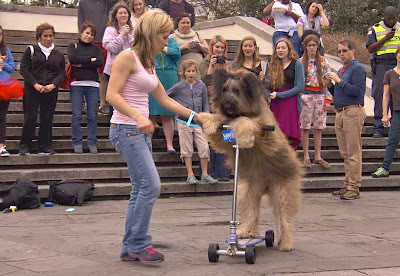 He's scooted his way into the Guinness Book of World Records! Read down the end of this post for details and photos! Norman the Scooter Dog has loved scooters since he was a pup, says his owner Karen Cobb. And today he'll go for the ultimate ride -- attempting to ride his way into the Guinness Book of World Records! It'll all happen, just up the road from us in Marietta, Ga., so we'll be there cheering on one of our favorite pals! The event will raise money for Road Trip Home, a Georgia-based group that rescues animals from high kill shelters. You can find out more about Road Trip Home on Norman's web site. Norman, a three-year-old French Sheepdog, will make the record-setting attempt this morning between 7-9 a.m., at the All Tournament Players Park in Marietta, Ga. He needs to do 30-meters in less than 30 seconds to break the record. 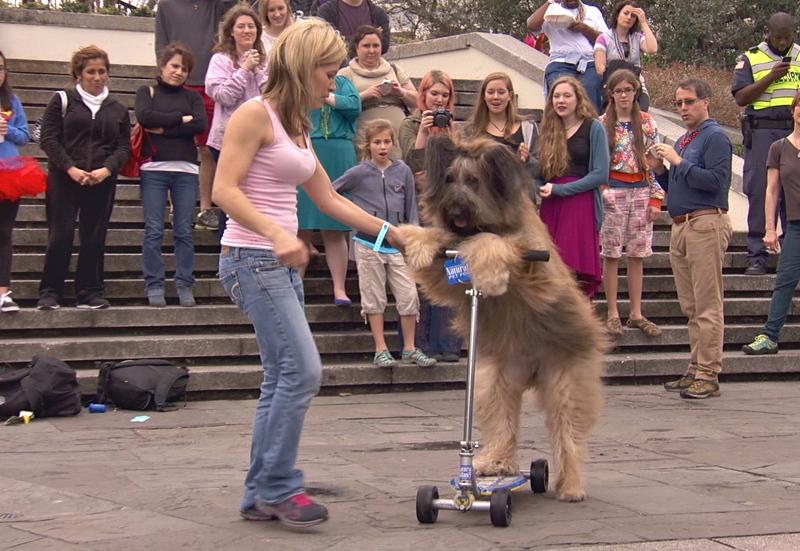 Norman's used to being in the spotlight, appearing on many TV shows and in the series Who Let The Dogs Out with his pals from Natural Balance. He'll also make an appearance at BarkWorld Expo in Atlanta next month. Will he break the record? We think he can! Come back later and we'll let you know how he did! UPDATE: Norman SMASHED the record with a time of 20.75 seconds, securing his spot in the Guinness Book of World Records! 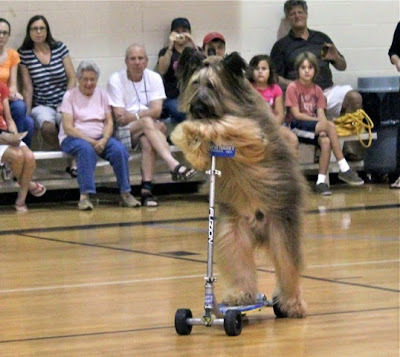 Norman was cool as a cucumber and so was his owner Karen Cobb, as Norman easily scooted into the record books. After the record-setting performance, Norman posed for pictures with most everyone in the crowd who turned out to witness the feat early this morning. Norman also wowed the crowd with his bicycle-riding skills. That's one fit doggie! Check out more photos on our To Dog With Love Facebook page and then head over to Road Trip Home, the rescue group Norman designated as his charity of choice for this event! We also heard some breaking news! Norman and the Natural Balance crew will be heading to France this fall to start filming the third season of Who Let The Dogs Out! Oooh-la-la! That episode will be something to watch! And if you want the chance to see Norman before he heads off on his French adventure, he'll be appearing at BarkWorld Expo next month. You can register for BarkWorld here. Hooray for FitDogs raising money (and setting records!) I have loved watching Norman's videos. We will see you later. Have a fabulous Friday. Oh my that is amazing! I'm speachless!!! Good luck Norman, Let' us know how it goes Rocco. Norman was AMAZING! He hopped on that scooter and got it done! .... ANNIHILATING the world record by a full 9.25 seconds! You'll get to meet him at BarkWorld! Mom saw him at BlogPaws and said he was awesome. Maybe I will make it to BarkWorld and can see him with my own puppy eyes! That is so pawsome he set a record! Norman and Karen were fabulous! I sure hope you make it to BarkWorld! Watching Norman in person is AMAZING. What really astonished me is that this was even in the books to be beaten. Very cool, Norman! That is soooooo cool! Way to go, Norman!